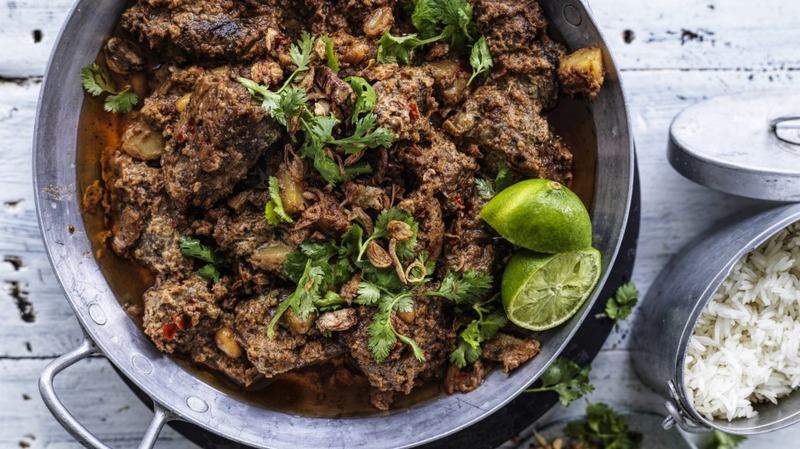 ​This delicious, rich curry is easy to cook once the paste is made, and is also great with lamb or chicken. 1. For the curry paste, preheat oven to 150°C (130°C fan-forced) and roast peanuts on a baking tray for 15 minutes or until lightly golden. Remove nuts from tray and then roast coconut for about 10 minutes and then bay leaves for 5 minutes. Set all aside to cool. 2. Heat a frying pan over low heat and lightly toast cardamom seeds until fragrant, about 5 minutes. 3. Grind the roasted bay leaves and cardamom seeds together with cloves in a spice grinder (or use a mortar and pestle) to form a fine powder and set aside. 4. Process peanuts, coconut, ground spices, chilli, water and salt together to form a coarse paste similar to chunky peanut butter. Add a little extra water if it becomes too thick or hard to process. 5. For the curry, place coconut cream, cassia bark, cardamom seeds, lemongrass and lime leaves in a large, heavy-based pot and, over a medium heat, bring to a gentle boil for five minutes to infuse the flavours. 6. Add beef to the pot and bring up to a gentle boil again, then reduce heat to very low and simmer uncovered, stirring occasionally, for 1.5-2 hours or until the meat is tender. Drain off the braising liquid and reserve. 7. Keeping the meat in the same pot, add the curry paste, ginger and peanuts and cook over a medium to low heat for 10 minutes, stirring occasionally. 8. Add the reserved braising liquid, potatoes, palm sugar, fish sauce and tamarind water and cook for a further 20 minutes or until the potatoes are cooked through. 9. Taste and adjust seasoning; the curry should be quite dry, but add a little extra coconut cream if required to form a wetter gravy. 10. Serve immediately in a large bowl with crispy shallots, steamed rice, and with a squeeze of lime and coriander to taste.